In 1872-73 white settlers were moving into the North Loup Valley. Their presence sparked occasional conflicts with Lakota Sioux wandering down from the north to hunt or raid the Pawnee Reservation near Genoa. On January 18, 1874, Sioux passing through this area with stolen Pawnee horses purportedly took food, furs, and a cow from the homes of settlers and trappers, including the Colby and McClimans families. Early the next morning about a dozen men led by Charles ("Buckskin Charley") White went in pursuit, determined to recover the property or fight the Indians. The men found the Lakota camped on Pebble Creek. During a parley, the Indians refused to surrender anything of value and prepared to resist the whites, who fled to the shelter of the stream bank. In the half-hour fight that followed, Marion Littlefield was shot and killed. Indian casualties were estimated as three dead and several wounded. The settlers feared further confrontations and petitioned Congress for military protection. After receiving an appropriation, the army established Fort Hartsuff in the North Loup Valley on September 5, 1874. 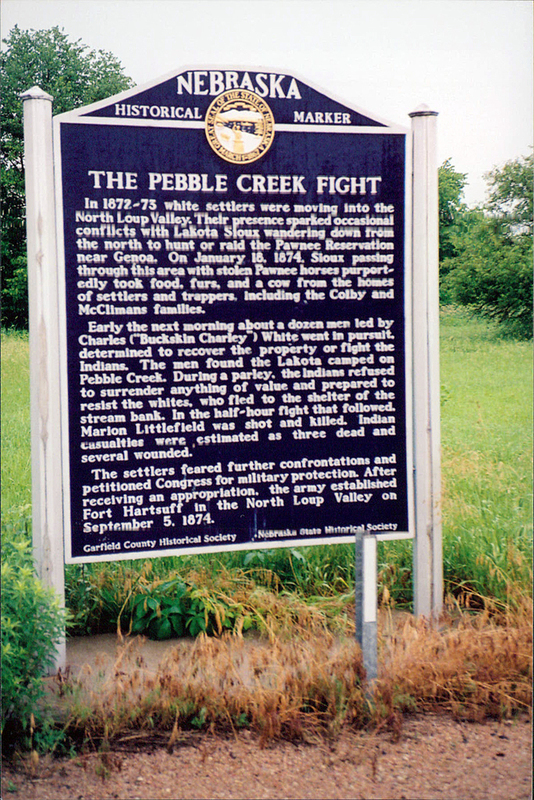 “The Pebble Creek Fight,” Explore Nebraska History, accessed April 19, 2019, https://mynehistory.com/items/show/241.